There isn’t a timelier art exhibit anywhere at the moment than the show of Philip Guston’s suite of drawings about Richard Nixon and his era now on display at Hauser & Wirth’s new gallery on 22nd Street in Chelsea. There isn’t a timelier art exhibit anywhere at the moment than the show of Philip Guston’s suite of drawings about Richard Nixon and his era now on display at Hauser & Wirth’s new gallery on 22nd Street in Chelsea. Hauser & Wirth now represents the Guston estate, and the current exhibit is its second devoted to him this year. They couldn’t be more different in the facets of Guston they reveal. Once the painter’s painter of Abstract Expressionism, he shocked the art world in the 1970s with seemingly crude figurative canvases that drew upon the comic book styles of the 1930s. Pop Art had already done the comics with Roy Lichtenstein, but Lichtenstein’s elegantly ironic sendups of the medium were a far cry from Guston’s unsettling—and often very funny—caricatures of gangsters, Klansmen, and other sinister figures. The art establishment not only attacked but reviled their erstwhile darling, and it would be some time before critics assimilated what Guston had done in probing the violence and anomie at the core of American culture, as well as recasting his rich painterly style. Hauser & Wirth’s earlier show, Philip Guston: Painter, 1957-1967, which focused on the largely monochromatic works that preceded his figural breakthrough—or rather, his rethinking of the image-based painting that had preceded his Abstract period—seemed a world away from the works of his final decade (he died, at the height of his powers, in 1980). There are, however, hints of things to come in the works of the 1960s. As Guston himself remarked, his art was “image-haunted” at every phase of his career; but to get at the repertoire of images he would finally produce, he practiced the severest reduction of his art. For two years at the end of the Sixties, he produced only drawings, some consisting of barely more than a stroke or two, before his rogue’s gallery emerged together with its accompanying “signs”—blank walls, ladders to nowhere, dangling light bulbs. At first, Guston’s art seemed openly political, although as the 1970s progressed his images became more and more polyvalent. Going back to his easel, however, he never ceased to draw, and he had a secret subject: Richard Nixon. The Nixon suite was never exhibited during Guston’s lifetime, and it has never, until now, been seen in its entirety. The current show was deliberately timed to coincide with the wretched electoral season we’ve just endured, and nothing could be more appropriate to it. Nixon, the Darth Vader of the American presidency, was a figure in the sharpest contrast to our new President-Elect: a brooding introvert who exposed himself to the relentless glare of politics; a man of seething resentments who projected a mask of eerie composure; a personality devoid of charm who desperately craved approval. Nonetheless, he and Donald Trump share one thing in common: it is already apparent that the two will soon be linked as the worst presidents in American history. And, if you want to know how bad things will be, Guston’s Nixon will give you all the idea you need. The Guston suite falls into two distinct parts. The first, partly inspired by Philip Roth’s anti-Nixon satire, Our Gang, dates from 1971, a time before the full extent of what would come to be called the White House horrors would be known, but when we’d already had the Kent State massacre and the secret bombing of Cambodia and Laos. Roth was a close personal friend of Guston, and a collector of the new work still being ostracized in the art world. That work had been partly a response to Guston’s sense that Modernist art, of which he had himself been a so assured a practitioner, had gotten too far away from public reality, and now represented a dodge. He went deep into himself, and to the most basic elements of art, mark and image making, to find the right means—and the vision—to express his sense of America’s regression into violence, both in Vietnam and in the backlash against the civil rights movement that, in the wake of the King and Kennedy assassinations, had set the country aflame. The startling images of hoods and Klansmen he both drew and painted, cruising about an urban wasteland in their jalopies, nail-studded clubs raised high, caught this spirit with uncanny compression and accuracy. But behind it all, he came to feel, was the brooding, tortured figure of Richard Nixon, who represented the worst impulses of America’s worst hour. Guston’s other figures were generic symbols of violence and evil. Nixon, he came to feel, had to be addressed personally. The trigger for the series that Guston would call Poor Richard, an ironic allusion to Benjamin Franklin’s almanac of that name, was the publication of the Pentagon Papers in July 1971, with their revelation of government scheming and lying about the still-raging Vietnam War. It coincided with preparations for Nixon’s trip to normalize relations with China, which he had built his career on demonizing. “Poor Richard” was also an oblique reference to the Checkers Speech in which Nixon had pleaded personal poverty during his 1952 vice presidential campaign, and to the self-pity that he projected as an essential part of his personality. Early works in the series showed a young Nixon fantasizing in bed, erotically and otherwise, and boning up for his legal and political career. The famous ski nose, alert to opportunity, serves Guston as a penile instrument, a handy digit, and a personal periscope. Guston doesn’t belabor the stages of Nixon’s career, moving swiftly from his arrival in Washington as an anticommunist legislator to his presidential encampments, chiefly in Key Biscayne, where he huddles with his policy guru, Henry Kissinger, represented as an anxious pair of glasses scuttling, like T. S. Eliot’s claws, on an ocean floor of intrigue; his pipe-smoking legal enabler, Attorney General John Mitchell; and his preferred foil, Vice President Spiro Agnew, the hapless object of his frequent and vitriolic discharges of temper. No matter, though: Nixon, even among cronies and enjoying the prerogatives of office, is always essentially alone, as in the image that shows him, face darkened, kicking a beach ball along a strip of Florida surf. 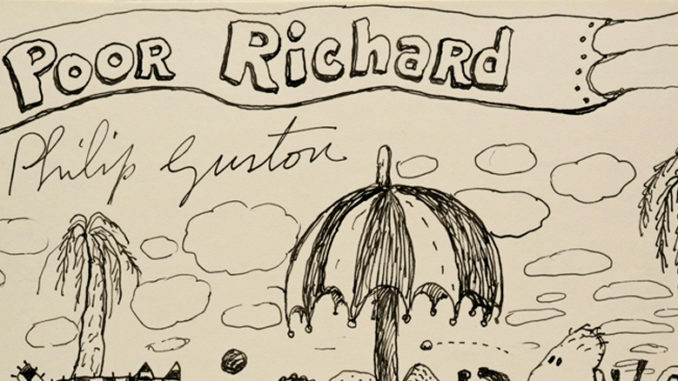 It is here, in Guston’s penetration of an essentially inconsolable character, that Poor Richard encapsulates Nixon’s political tragedy, and its near-tyrannical consequences for the rest of us. The 1971 suite ends with the trip to China, with Nixon in mandarin getup and a menacing dragon looming above him and the hapless Kissinger: America, it is clear, will be had in the exchange with the wily Mao Ze-dong. But Guston was moved to revisit Nixon in 1975, after his fall from office and in his self-imposed exile in San Clemente. Nixon had suffered a near-fatal bout of phlebitis, and the central image of this short but trenchant suite of drawings (with one accompanying painting on the same subject) is of him dragging, or being dragged by, an enormously swollen leg and foot, now replacing the nose as his characteristic digit. The satirist’s anger is still evident; Nixon is unforgiven, as he still remains for most of us. But there is pity, too, for Poor Richard, and a sense of the way in which he is all too representative of the underside of America’s national character. And now we have, in our demagogic moment, a successor to the needy narcissist who was our 37th president in our soon-to-be 45th, Donald Trump. Material poverty isn’t Trump’s problem, but, in his constant need for praise and reassurance, he represents a kind of flip side to Nixon. And, as if to carry the Nixonian torch across the decades, the now 93-year-old Henry Kissinger was recently spotted coming to pay his respects at Trump Tower. All we lack, now, is a satirist of Guston’s genius to do our current spectacle justice.